Every month, the Voices of the Temple podcast — the official podcast of the Temple of Witchcraft — provides news, information, interviews, and insights into the greater Temple community. Hosted by Virgo Minister and Temple Founder Adam Sartwell, Voices of the Temple connects listeners across geographic boundaries, creating a space for fellowship, learning and community. Voices of the Temple is entertaining and educational, but most of all, it’s magickal, creating a sacred space that both literally and figuratively transcends time and place. Listeners can download the program and tune in at their convenience, joining Adam through the entire show, from invocation to devocation, whenever and wherever. One of the podcast’s regular features is an interview with a Temple lead minister. Conducted by Adam, these interviews explore not only the duties of each ministry as it relates to the larger mission of the Temple, but also provide a portrait of each minister’s personality and spiritual philosophy. Part theological discussion and part personal history, these conversations reveal the heart of the Temple by illuminating how each member serves in his or her own unique capacity. Each voice provides a thread in the tapestry—it’s Adam’s job over the next year to ask the questions that will weave those separate threads into a fully integrated whole. In this conversation, we explore Adam’s role in Voices of the Temple, how it functions within the Temple, and how it is furthering his own growth as a witch. The Temple Bell: Can you tell us a little about yourself? Adam Sartwell: Well, let’s see. I am one of the founding members of The Temple of Witchcraft, the others being my partners Christopher Penczak and Steve Kenson. I run the Virgo ministry. I grew up in small town Vermont. I have been a witch since I was fifteen years old, and now at thirty-one, I have been practicing for more than half my life. TB: What does your spiritual practice bring to your role as an interviewer? AS: I think that it helps that I know about what it means to be a witch, the ups and downs of it. I also think it helps me to ask inspired questions which bring forth a glimpse of the true self of each guest and enlighten listeners in their own practice. TB: Have you learned anything new about yourself or your spiritual practice during these interviews? AS: I have learned to have more confidence speaking. It has enlightened me on how my own path has become less about my own journey and more about the journey of the community. It is also a great reminder of the personal practice that helps me BE the magic I want to create. I was solitary for a long time, so community work is a big change. TB: What role do you see Voices of the Temple playing in this journey, especially as it relates to the mission of the Temple? AS: One listener came up to me in one of our events. She told me that she loved the podcast because it kept her connected to what was going on with the Temple even though she lives in New York. As the Temple grows and gets its federal non-profit status, our Temple will spread out, and the podcast will help us all keep in touch. It also gives us a chance to meet our ministry leaders, and hopefully in my second year, some craft elders and teachers. TB: How did the idea for a podcast originate? AS: Actually, it was something I thought of while listening to Elemental Castings, T. Thorne Coyle’s podcast. I then brought it up to the other founders, and we thought it would be a good idea for the Temple. I then started listening to other Pagan podcasts and chose the elements I liked and added some of my own. TB: What did you add that makes it yours? AS: Well, first I noticed how serious people were about Pagan podcasts. I think we forget the Goddess likes to laugh with us. TB: That’s an excellent point! These podcasts are very light-hearted yet nonetheless profound. Do you find your guests entering into this mindset with you? AS: Yes. More then one of my guests has said how at ease they were in the interview when they had been nervous before. TB: Do you have any special techniques, magickal or otherwise, for creating this atmosphere? AS: We say a prayer before we even turn on the microphone. I also like to clear the space. Though not a magickal technique, in the pre-interview talk, the guest and I go over what is going to happen, what the questions will be, and what the guest is comfortable sharing. So we can both relax and have fun. TB: And having fun is important, absolutely. I imagine that having that sense of security and safety certainly creates openness. Do you do anything special to prepare yourself? AS: I like to ground and center, and connect to my Higher Self and ask it to guide my thoughts, words, and deeds to make the podcast the best it can be. TB: Do you do any research beforehand? AS: Yes, though I know most of the people I have interviewed so far. Sometimes I look into things that each ministry is doing so I can talk about that with them on the air. I am sure that I will have to do more of that in the second year of the show. TB: You mentioned before that you wanted to expand into the larger circle of teachers and leaders within the Temple? AS: Yes. In the second year, I want to expand the podcast to have teachers and elders from the Craft and Pagan community as a whole. TB: So these teachers and elders would be from other traditions, not just the Temple? AS: Yes. I think it is important for people to get introduced to the Head Ministers of the Temple, and after that is done, I want to move out into interviewing teachers from other traditions. One of the Temple’s main ideas is that we, as Pagans and Witches, are part of a timeless tradition. Our Mighty Dead, Ascended Masters, Hidden Company — or any other way you want to say it — come from the root traditions of Witchcraft today. So interviewing other traditions enriches our own. TB: So you’ll be on the other side of the interview table as the Virgo minister soon, right? AS: Yes, this September. I’m not sure if I should get someone to interview me or if I should interview myself using a funny voice. I do a great Kermit the Frog. TB: Now THAT would be an interview no one would want to miss! Catch up with Adam and Voices of the Temple via the Temple of Witchcraft site at www.templeofwitchcraft.org or on iTunes. Interviewer Tina Whittle is mystery novelist/freelance writer who lives and works in Southeast Georgia. She is a member of the Earth-based Spirituality Group at her local Unitarian-Universalist church, which she attends with her husband and daughter. Virgo Lead Minister and Temple Founder Adam Sartwell credits his psychic gifts with saving his life as a teen due to a vision of his own demise. 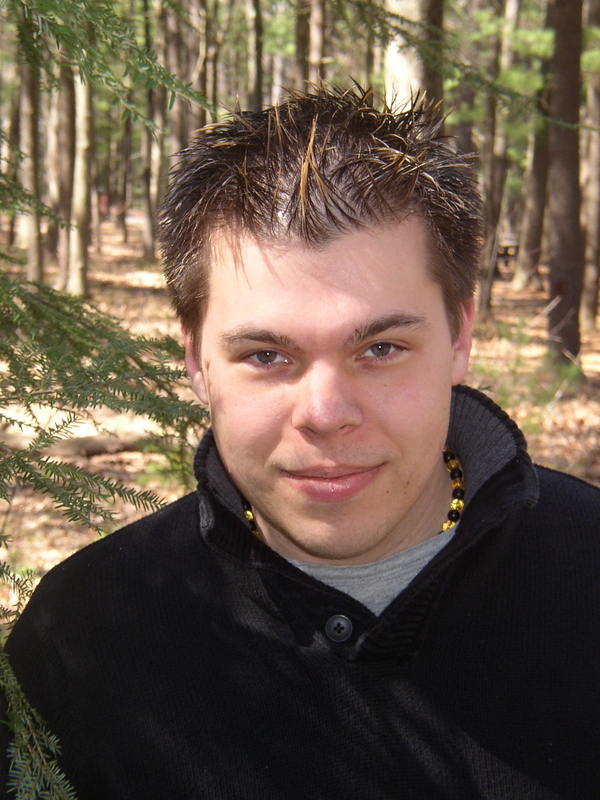 A graduate of Johnson State College in Vermont with a degree in Psychology, Adam works with developmentally challenged kids in Massachusetts and lives with his partners in New Hampshire.